Deck Side Table free plans. This sturdy outdoor sofa was built using 2 x 4s. Perfect for your patio or front porch. Build it using the free woodworking plans at the link. Outdoor Coffee Table free building plan. Build yourself an outdoor coffee table for your patio. The top measures 22 x 35 inches and you will find the free woodworking plans at the link. 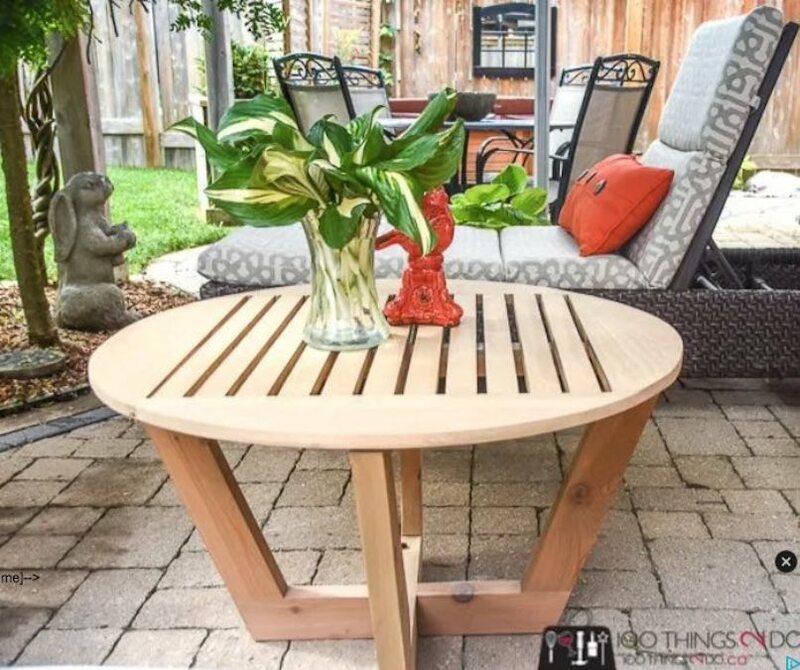 Patio Coffee Table free plan. Build this beautiful round patio coffee table using the free step-by-step instructions available at the link. Outdoor Sofa free building plan. Although this is an outdoor sofa, it is almost too nice not to be an indoor sofa. Find out how to build it at the link. Free plan to build a Low Rise Outdoor Sofa. Build a low rise outdoor sofa using the free plans provided at the link. This project fits a standard twin size mattress.